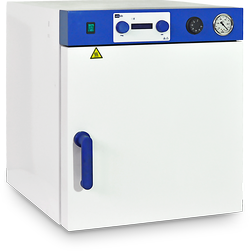 UOSlab vacuum drying ovens CB series are designed to obtain and maintain a stable temperature required for conducting research or drying samples in a technical vacuum (0.002 bar). UOSlab vacuum drying ovens CB series are distinguished for high reliability of operation. Vacuum drying ovens are equipped with a modern microprocessor temperature and time control system and a fault signaling.